Do you or does someone you know want to support the future of independent community media at KPFA 94.1 fm and kpfa.org? If so, run for a seat on our Local Station Board. KPFA needs new people with new ideas and energy to bring more community news, public affairs, cultural programming and new technology to the KPFA and the Pacifica network. United for Community Radio is seeking candidates to run on our free speech radio slate which represents individuals and organizations throughout KPFA’s signal range and beyond. We particularly seek those with geographic, racial and cultural diversity to join in our campaign as candidates and campaigners. 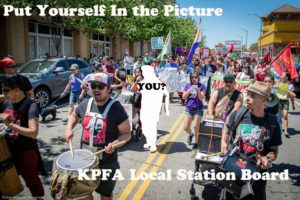 If you are a subscribing member, to KPFA, in the period 12 months prior to the election, you are qualified to run for the local board or to vote. To run, you need to subscribe ($25) in time, and you need to get 15 signatures on a petition from other members endorsing you as a candidate. Then you fill out some paper work about your goals and vision for the station and you become a candidate. Contact United for Community Radio for help or to explore joining our slate. Here’s the time table for the election. If the nominating period is extended, as it has been in the past, we’ll let you know. You must be a Listener member or Staff member in good standing by June 30, 2016 in order to be a candidate, and vote in the election. The elections at all Pacifica’s stations are being run by an independent person called the National Election Supervisor.